Hi everyone! I have another pretty mani to show you guys! I feel like a broken record, everyday I say I love my mani’s. Well, it’s to be expected I guess. I’m only going to buy things that I love (hopefully). But it’s not too hard to thrill me with nail polish. I’m not super picky and will wear almost anything! So today’s mani features another Jade polish from the “Unique Collection” I purchased a while ago. This one is called Exuberant and it is a beautiful royal purple loaded with blue & pink shimmer. This one dries dull but smooth, so a good shiny topcoat is needed. This polish is so super blingy in the sun! My pictures do not do the sparkle this gives off any justice. Formula was great. I used 2 coats plus topcoat for the pictures. I paired this with Anna Gorelova by Dance Legend #33 Casket. This is from her 2015 summer release. This is a beautiful medium pink with small pink and blue glitter and pink shimmer. It also has a very subtle holo spark in the sun. Formula was excellent! This did not dry gritty at all. Just 1 coat of topcoat was all I needed. 2 coats of polish was nice but you could still see the nail line, so I used 3 coats plus topcoat for the pictures. 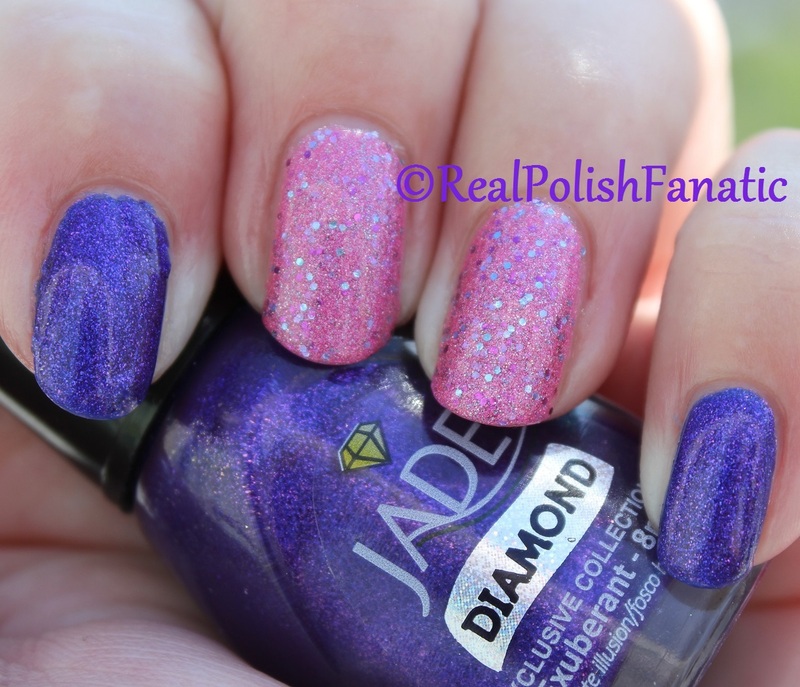 Jade “Diamond” Exuberant, 2 coats plus topcoat & Anna Gorelova by Dance Legend #33 Casket, 3 coats plus topcoat. If any of the pictures look blue on your monitor, it’s not. It’s a true royal purple. Well, that’s all I have for today!